On the second day of the Famine walk, the walkers visited the Ballybrannigan ticket office, which has been restored. It is a fitting place to reflect on the Strokestown 1490 emigrants and multitude of others who passed this way while travelling on the Royal Canal to Dublin. Professor Cian McMahon from the University of Las Vegas has discovered sample passage tickets used by Irish emigrants in 1847 and from Sir Robert Gore Booth’s estate at Lissadell in County Sligo who sailed to Saint John, New Brunswick in 1847. Le 17 mai 1847, le navire irlandais Carricks fait naufrage à Cap-des-Rosiers, à quelques centaines de mètres au large des plages gaspésiennes, avec à son bord 187 passagers irlandais et un violon signé Stradivarius. La quête de Charles Kavanagh est aussi celle de bien d’autres descendants d’immigrants irlandais; à travers l’histoire du naufrage du bateau Carricks en 1847, il ne lève pas seulement le voile sur l’histoire de sa famille, mais aussi l’héritage des Irlandais au Québec. On May 17, 1847, the Irish ship Carricks was wrecked at Cap-des-Rosiers, a few hundred meters off beach in Quebec’s Gaspé Peninsula, carrying 187 Irish passengers and a Stradivarius violin. Charles Kavanagh’s quest is also that of many other descendants of Irish Famine immigrants to learn more about their origins. He seeks to trace the story of the sinking of the Carricks Famine ship from which his ancestors Patrick and Sarah Kaveney survived in May 1847, and unveils the history not only of his family, but also the legacy of the Irish in Quebec. The film is directed by Viveka Melki and narrated by Charles Kavanagh, in collaboration with the archaeologist Martin Perron and the historians Simon Jolivet and Jo-Anick Proulx. Margaret Grant MacWhirter, Treasure trove in Gaspé and the Baie des chaleurs (1919), p. 13. Cap de Rosier has a tragic interest on account of the tales of marine disaster with which it is associated. The story is still told in Gaspe village of the good ship “Carricks” which sailed from Sligo, Ireland, in May, 1847. And old lady, perhaps the sole survivor, remembered the occurrence when interviewed by the writer. She, a child of twelve years, was one of seven children, and like all the passengers, her family were emigrants. After a rough and uncomfortable passage of twenty-three days, the captain missed his reckoning in a blinding snow-storm, and in the darkness of the night, struck the cruel cape. One stroke of the angry wave swept her clean. Comparatively few were saved, after hours of cold, hunger and fear such as may be imagined. The inhabitants came to the rescue, and treated the pitiable survivors with kindness. Truly the beach presented a gruesome spectacle the following day, strewn for a mile and a half with dead bodies. For a whole day two ox-carts carried the dead to deep trenches near the scene of the disaster. In the autumn the heavy storms sweep within sound of the spot. Thus peacefully, with the requiem of the waves and winds they rest. In recent years a monument has been erected to their memory by the parishioners of St. Patrick’s Montreal. Alas! this is only one of the many sorrowful tales which are related of Cap de Rosier. Canadian descendants of a family who fled Sligo during the Famine returned last weekend to retrace their last journey on Irish soil. Rose Marie and Terry Stanley walked the Famine Trail from the Caves of Keash to Sligo Quay on Saturday to mark the 170th anniversary since their forefathers, Patrick and Sarah Kaveney and their six children left Cross on the 5th of April 1847. They were joined by eight Canadian family members, their Ward cousins from Keash and the Keaveneys from Dublin. On their arrival at the Quay the group were honoured at a civic reception at City Hall hosted by Mayor of Sligo Municipal District Cllr Marie Casserly. Rose Marie expressed her appreciation to the Mayor and spoke of the impact of the walk together with the unexpected gift of finding the family’s Sligo roots and connecting with cousins here in Ireland. She committed to returning in 2021 to walk the Famine Trail again. While here Rose Marie will present a play called ‘EMIGRANT’ based of the epic journey of her ancestors, Patrick Kaveney and Sarah McDonagh. It will be presented in Cliffoney Hall on Thursday, 20th April at 8.30 pm, and in White Hall Keash on Saturday 22nd April again at 8.30pm. In Cliffoney Anne Hoey and Frank Kielty will assist the presentation. Patrick and Sarah,their six children and 172 other emigrants from Lord Palmerston’s estates sailed on board the Carricks of Whitehaven to Quebec. The ship ran into a late winter storm and was shipwrecked on 28th April 1847, in the Gulf of St Lawrence, just off the coast of Cap des Rosiers, Canada. Only 48 survived, including Patrick and Sarah together with their son Martin, but their five daughters perished. Irish Global Migration and Memory: Transnational Perspectives of Ireland’s Famine Exodus brings together leading scholars in the field who examine the experiences and recollections of Irish emigrants who fled from their famine-stricken homeland in the mid-nineteenth century. The book breaks new ground in its comparative, transnational approach and singular focus on the dynamics of cultural remembrance of one migrant group, the Famine Irish and their descendants, in multiple Atlantic and Pacific settings. Its authors comparatively examine the collective experiences of the Famine Irish in terms of their community and institution building; cultural, ethnic, and racial encounters with members of other groups; and especially their patterns of mass-migration, integration, and remembrance of their traumatic upheaval by their descendants and host societies. The disruptive impact of their mass-arrival had reverberations around the Atlantic world. As an early refugee movement, migrant community, and ethnic minority, Irish Famine emigrants experienced and were recollected to have faced many of the challenges that confronted later immigrant groups in their destinations of settlement. This book is especially topical and will be of interest not only to Irish, migration, and refugee scholars, but also the general public and all who seek to gain insight into one of Europe’s foundational moments of forced migration that prefigures its current refugee crisis. This book was originally published as a special issue of Atlantic Studies: Global Currents. 1. Irish global migration and memory: transnational perspectives of Ireland’s Famine exodus 2. Memory and John Mitchel?s appropriation of the slave narrative 3. Recrimination and reconciliation: Great Famine memory in Liverpool and Montreal at the turn of the twentieth century 4. Remembering Canada: the place of Canada in the memorializing of the Great Irish Famine 5. ‘‘Neither do these tenants or their children emigrate’’: famine and transatlantic emigration from Finland in the nineteenth century 6. Famine, home, and transatlantic politics in two late nineteenth-century Irish-American novels 7. Famine memory and the gathering of stones: genealogies of belonging. Marguérite Corporaal is an Associate Professor of British Literature at Radboud University Nijmegen, Netherlands, and principal investigator of the research program Relocated Remembrance: The Great Famine in Irish (Diaspora) Fiction, 1847–1921. She is also director of the International Network of Irish Famine Studies that is funded by the Dutch Research Council (2014-2017) and based at Radboud University Nijmegen. Jason King is an Irish Research Council Postdoctoral Researcher in the Moore Institute at the National University of Ireland, Galway. His publications include numerous articles in the field of Irish Studies, with a special focus on Irish–Canadian and Irish–American history and culture. In addition, he is the coordinator and lead researcher of the Digital Irish Famine Archive. A family’s 21-mile walk to get to Sligo Port to leave for Canada during famine times on a ship that eventually sank will be commemorated next month. On 4th April, Rose Marie Stanley with her husband Terry will lead a Famine Trail Commemoration Walk from Cross, Keash to Sligo Port. Rose Marie is a fifth generation descendent of Patrick and Sarah Kaveney, who with their six children did this same walk on the 4th April 1847, when as famine victims they left Ireland in the hope of a better life in Canada. Mullaghmore and Cliffoney Historical Society in conjunction with descendents of different branches of the Kaveney family and other walking groups are undertaking this walk in memory of Patrick and Sarah and their six children, and all those who sailed with them to Canada on the ill fated Carricks in April 1847. The walk is 21 miles long and will start at the old Kaveney homestead in Cross at 9am and will proceed through Ballymote, Colloney, Ballysodare, and on to Sligo Port where they will arrive about 4pm. A short ceremony will take place at the pontoon beside the Custom and Ballast Quays, from where the Carricks set sail on its final journey. Patrick and Sarah Kaveney were tenants of Lord Palmerston and became the first batch of his Assisted Emigrants to leave Sligo in 1847 for Quebec. 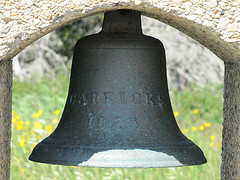 Patrick and Sarah left on the 5th April 1847. At Sligo Port they were joined by 28 other families, a total of 173 emigrants, all former Palmerston tenants. Some 17 of the families came from the Ballymote estate, 5 more came from Ennismurray, and 6 came from Ahamlish. 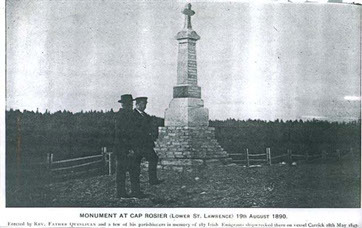 Just over three weeks after leaving Sligo these emigrants entered the Gulf of St. Lawrence and were in sight of the Canadian coast when the Carricks was caught in a snow storm and crashed into the notorious Cap des Rosiers. Only 48 passengers survived. Patrick and Sarah with their son Martin survived; their five daughters were drowned. They set up home in Jersey Cove and had four more children In 1855 Patrick died in a snow storm as he attended St. Patrick Day celebrations. Rechristened Kavanagh in Canada, Patrick and Sarah set about establishing their new lives and local families helped them out until they could fend for themselves. They set up their new home in Jersey Cove, the Gaspe, had four more children and in 1855 Patrick died in a snow storm as he attended St. Patrick Day celebrations. Now 168 years after arriving in the Gaspe, family branches have spread out across Canada, but they still retain the family base in Jersey Cove. Most family branches are French speakers although some remain English speakers. Down the generations the family retained knowledge of, and came in search of, their Sligo roots. But only in recent years were they able to re-establish those roots and reconnect with long lost relatives who will join Rose Marie and Terry on the upcoming walk. A monument, erected by the parish of St. Patrick’s Montreal, stands in the Gaspe in memory of those who drowned with the sinking of the Carricks. In May 2011 long lost remains were found in what appears to have been a mass grave near where the tragedy occurred. Investigations are underway to determine if these remains are those of Carricks victims.